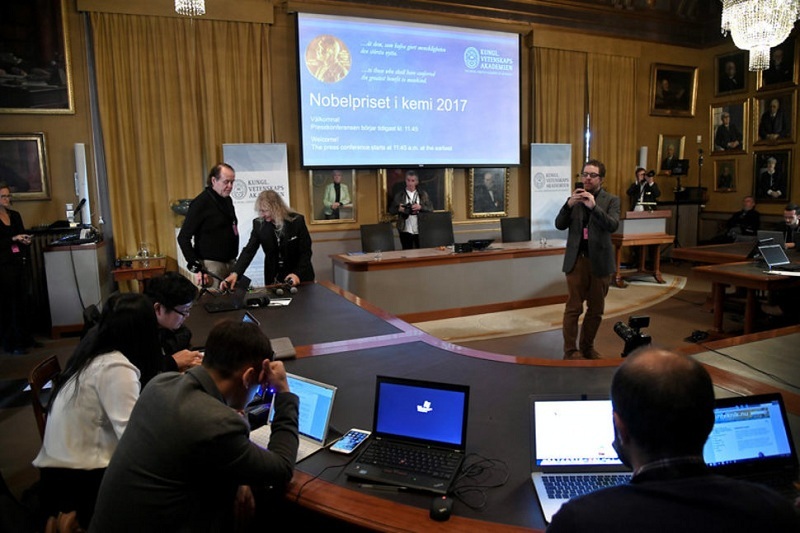 Journalists prepare themselves for the announcement of the 2017 Nobel Prize winner in Chemistry at the Royal Academy of Sciences in Stockholm, Sweden, October 4, 2017. STOCKHOLM - Scientists Jacques Dubochet, Joachim Frank and Richard Henderson won the 2017 Nobel Prize for Chemistry for developing cryo-electron microscopy which simplifies and improves the imaging of biomolecules, the award-giving body said on Wednesday. "This method has moved biochemistry into a new era," the Royal Swedish Academy of Sciences said in a statement awarding the 9 million Swedish crown ($1.1 million) prize. "Researchers can now freeze biomolecules mid-movement and visualize processes they have never previously seen, which is decisive for both the basic understanding of life's chemistry and for the development of pharmaceuticals." The prizes are named after dynamite inventor Alfred Nobel and have been awarded since 1901 for achievements in science, literature and peace in accordance with his will. Scientists Jacques Dubochet, Joachim Frank and Richard Henderson won the 2017 Nobel Prize for Chemistry for developing cryo-electron microscopy which simplifies and improves the imaging of biomolecules, the award-giving body said on Wednesday.